That the past career and record of C. W. Tobie, the Burns investigator who came to Atlanta to probe the Phagan mystery for Colonel Thomas B. Felder, is being investigated by the local police is shown by a telegram received by Chief of Police J. L. Beavers Monday morning. 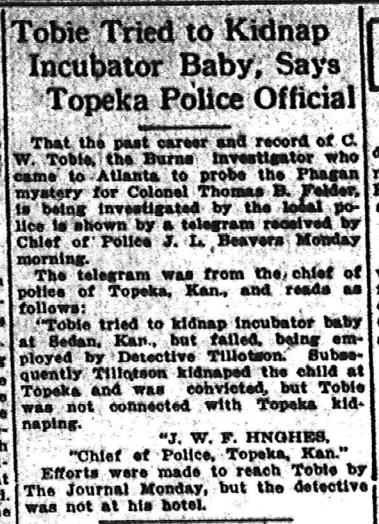 “Tobie tried to kidnap incubator baby at Sedan, Kan., but failed, being employed by Detective Tillotson. 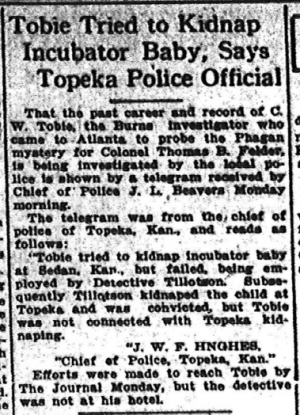 Subsequently Tillotson kidnaped the child at Topeka and was convicted, but Tobie was not connected with Topeka kidnaping. Efforts were made to reach Tobie by The Journal Monday, but the detective was not at his hotel.